Your skin needs powerful boosting beauty-ally, to "restart" and repair? 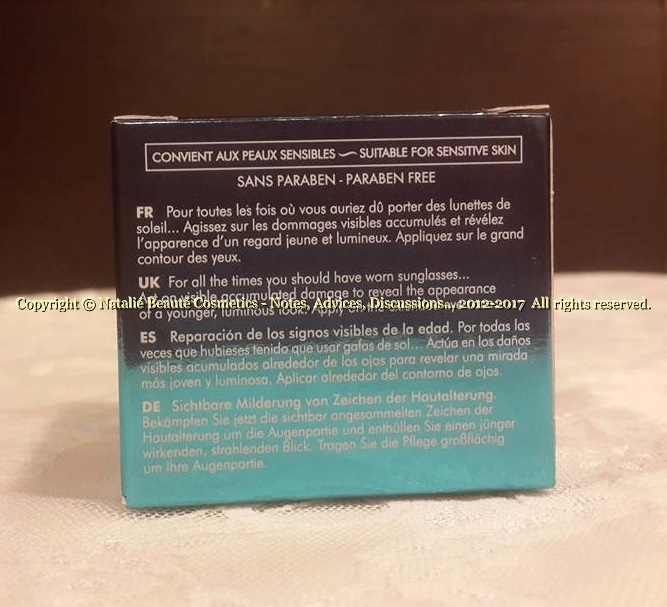 It's dry, dull, fine wrinkles are around, it looks tired, no healthy glow, there are dark spots, lost elasticity, needs more moisture and nourishing? Is this, what the mirror shows you back? Than, this article is for you. Most probably, the answer of your needs is here. This is how, I'm solving this sort of troubles. 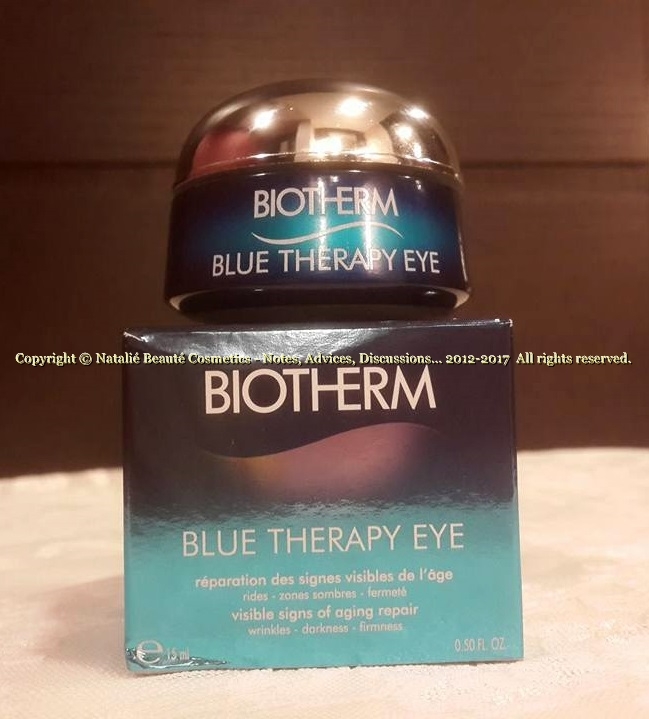 Recently I came across two wonderful products - BLUE THERAPY NIGHT and BLUE THERAPY EYE by BIOTHERM, from the BLUE THERAPY Line. I've never used anything from this brand before, but as all advertisements do it's to give to our attention something new for us, something, what may respond adequately to our needs. - All products are based on Sea/Ocean/Lake products, such as thermal Plankton extracts; macro and micro algae extracts from Marine algies, Lake algies; thermal water, ocean water. 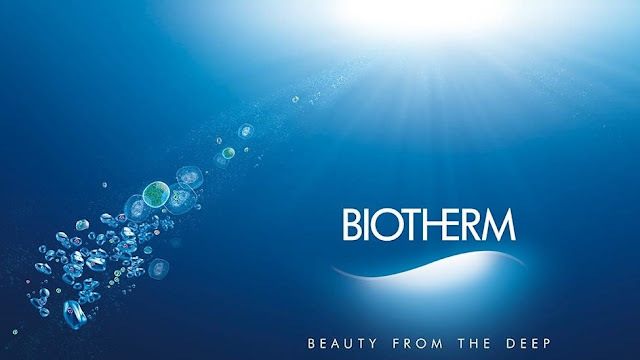 Also, BIOTHERM is initiating their own cause about ENVIRONMENTAL PROTECTION ON PLANETARY LEVEL. After all time, I spent in reading and from all, what I've already learned, I made my choice - products from BLUE THERAPY Line. BLUE THERAPY Line is based on its own specific ingredients - Laminaria Ochroleuca, AFA (A.flos-aquae extract, rich of proteins, called "blue retinol"), Plankton, Marine Connectum™ (sea sugar, secreted by a marine micro-organism), Alaria Esculenta - ALGAE OF YOUTH™ extract. 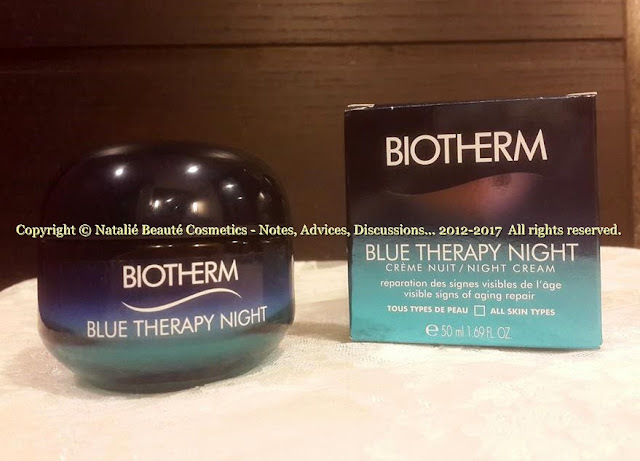 "It's during the night that the skin is most receptive to regenerate and repair itself. Sheltered from external aggressors, act on the appearance of the signs of aging. Morning after morning, wake up to reveal a younger looking you: wrinkles appear smoother, dark spots appear reduced and contours feel firmer." "Extracts of a macro and micro algae which have survived due to their regenerative and reparative powers. 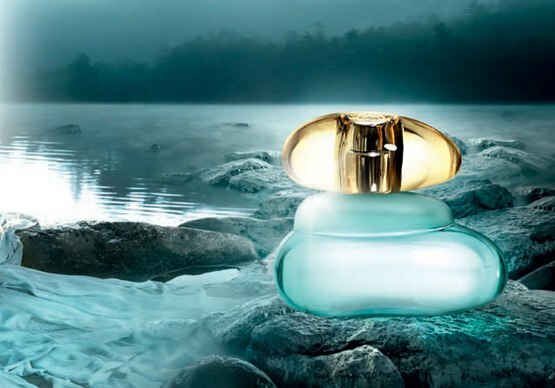 United in synergy, they offer exceptional properties to the skin. L. ochroleuca: A macro-algae from North Brittany waters in the Atlantic Ocean, known for its reparative action. 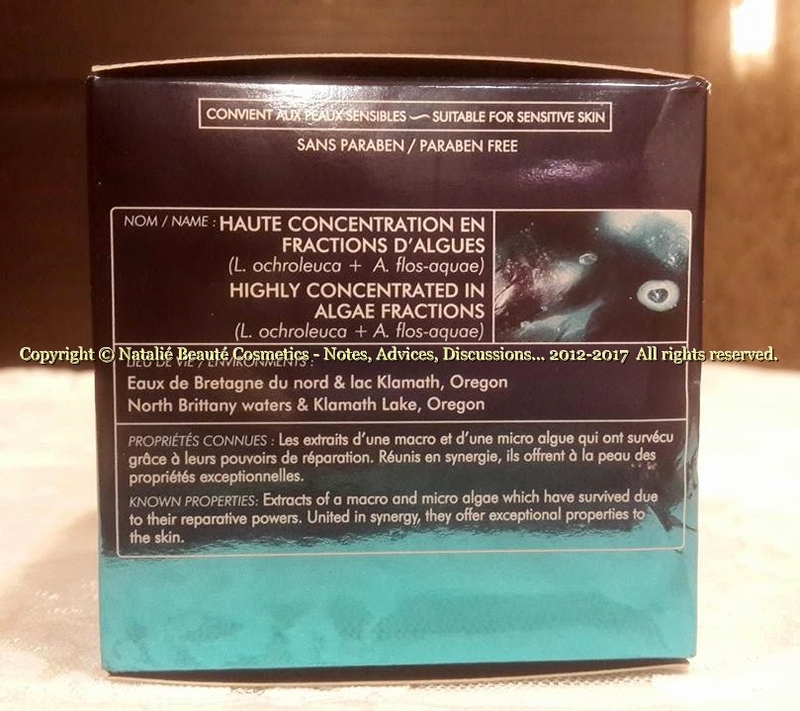 A. flos-aquae: From Klamath Lake, Oregon, known for its firming action." 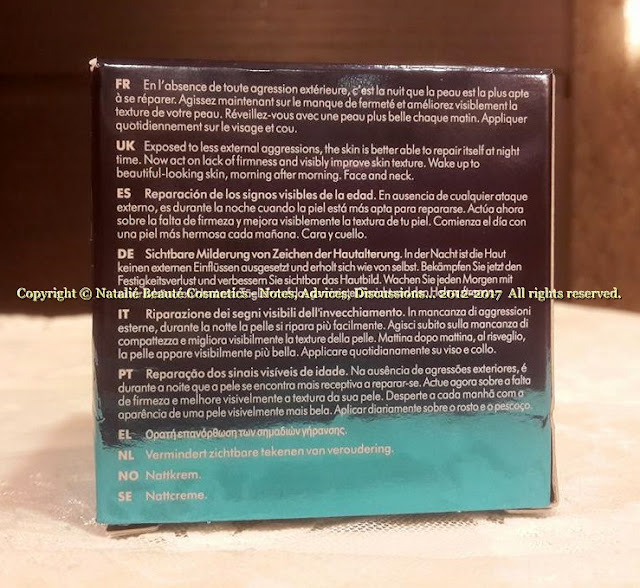 What are my impressions from this product? 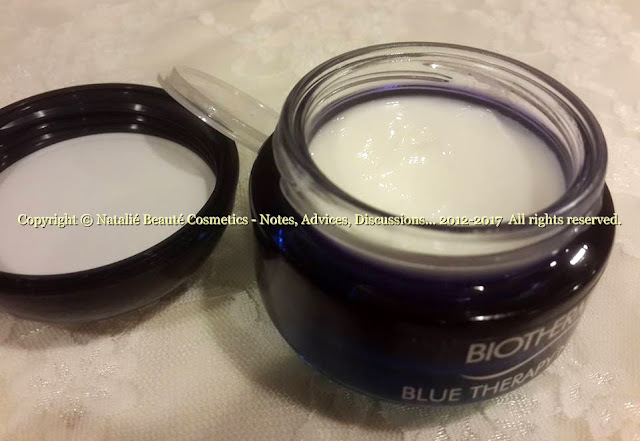 The cream has light, very easy spreadable on the skin texture. Very good, to make light massage, while you are applying it. Looked at it, in the jar it seems like light butter texture, but once you touch it, it melts on your finger and skin. Its scent reminds a scent of Cucumber, mixed with something else and this "something else" are the sea products. 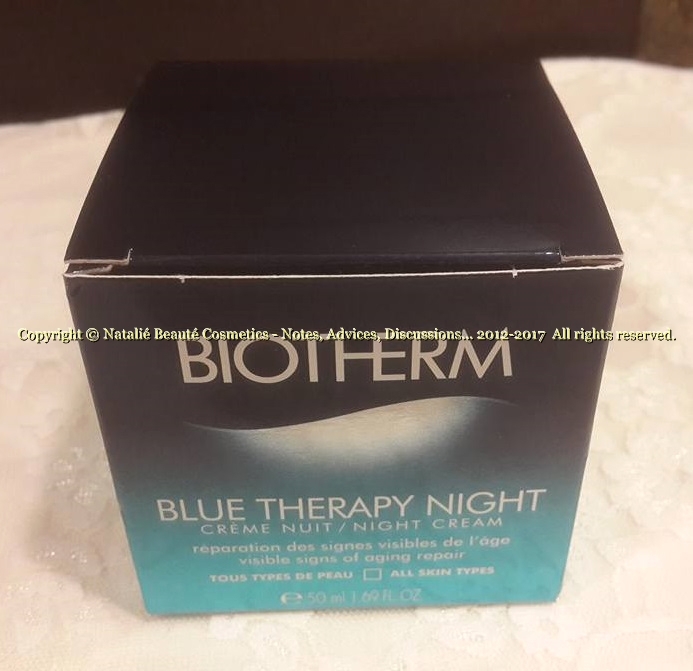 Apply it on your clear skin generously with light massage motions and any excessive amount from the product, you can absorb with soft paper tissue. In the morning, the skin looks relaxed, refreshed, ready for the new day. It also evens the skin tone. Day by day, it works for the better health and also visual condition and appearance on your skin. The cream has high skin tolerance, it is suitable even for very sensitive skin. I like this product very much! "The eyes zone is the most attention-winning of the face for age perception. This is why your eyes require specific anti-aging skincare. 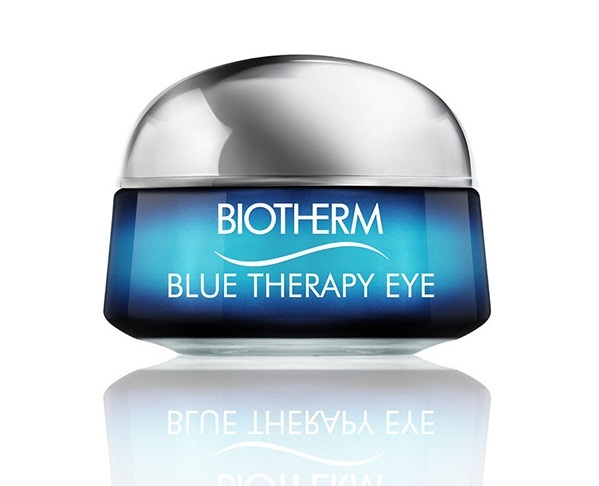 For the first time, Biotherm extends the very definition of the eye zone to target wrinkles, darkness and lack of firmness and go beyond the classic crows’ feet wrinkles and under-eye bags. Act on visible accumulated damage to reveal the appearance of a younger, luminous look." "For all the times you should have worn sunglasses... Apply on the extended eye zone." 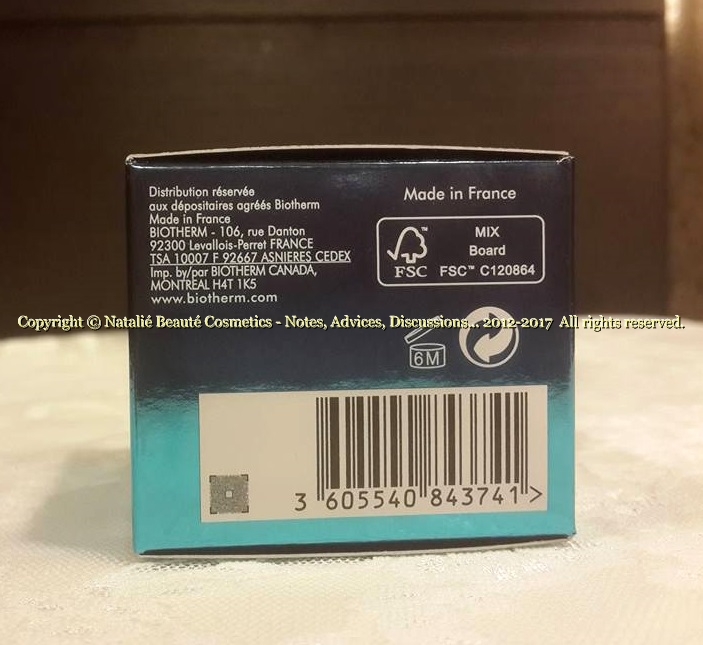 "Extracts of Pure Thermal Plankton, Macro-Algae L.Ochroleuca and Micro-Algae A.Flos-aquae. 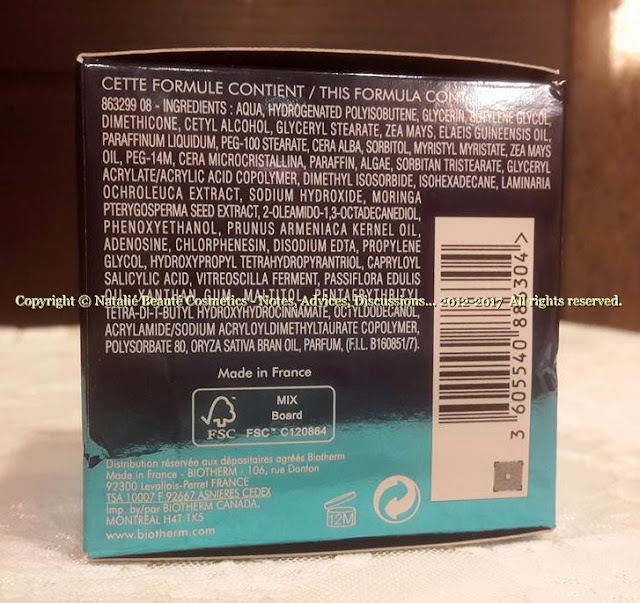 Also contains Flavonoid, Amino acid and Peptides." In other words - Matrixyl 3000. Very good explanation of this Peptide I found here. In brief - Matrixyl acts, as it literally plumps up, pushes up, the bottom of the wrinkle. Matrixyl has accumulating effect, that's why, it usually must be used as therapy. When you finish Matrixyl containing product (serum, cream), you don't use it in the next 6, 8, 12 months. This is how long the effect can prolong. 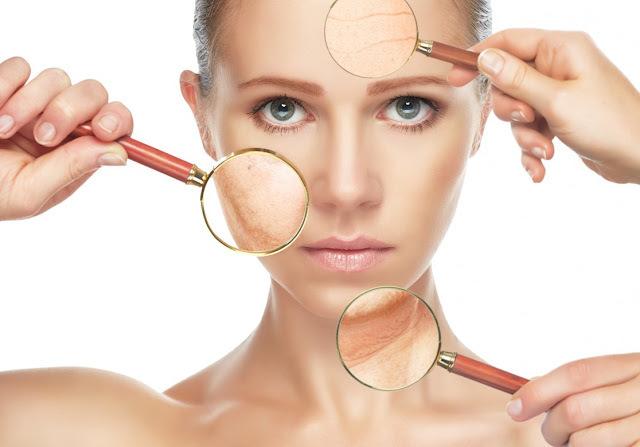 Of course, the effect depends on your individual skin characteristics and lifestyle. 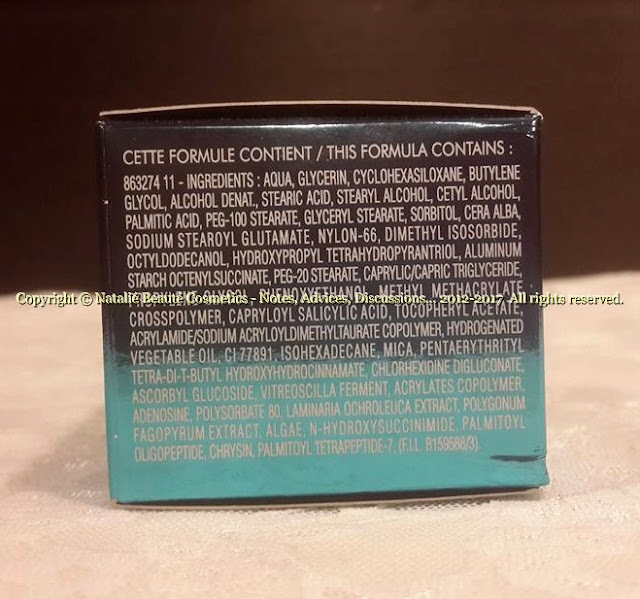 After this time - when it's already visually needed, you can go back to this product (or other product, containing the same peptide in the same or other formulation). 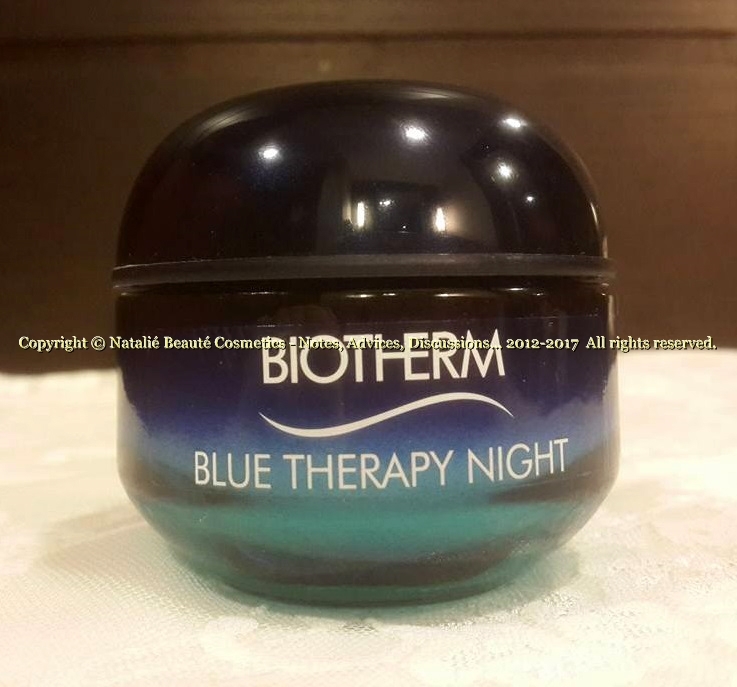 It has the same texture as BLUE THERAPY NIGHT, but one shade softer. It's also melting on the finger. It's scent is not as Cucumber, but more like cream from the Pharmacy. The feeling, which it gives to the skin, can little bit surprise you from the beginning - it's like very very light menthol sense, but with the time, it's not bothering at all. 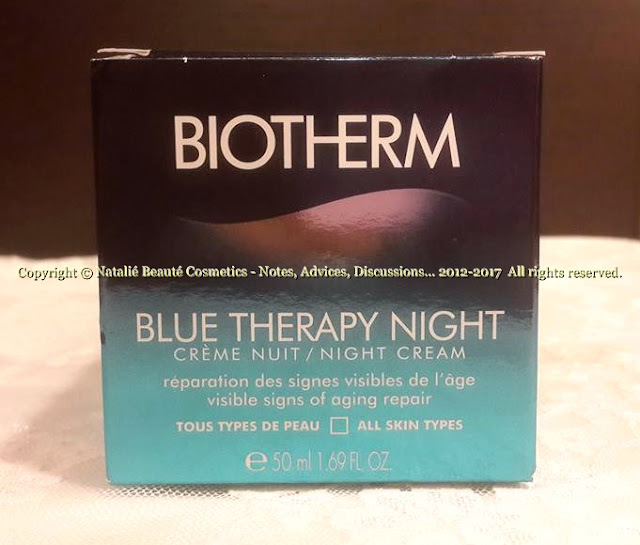 The skin absorbs this cream easy and quickly. It's good product under your make-up. The good thing here is, that the product really works! I'm using this product regularly - each evening, and after 2 weeks, I started to see the result. Both products are highly tolerant to the skin. They are suitable even for sensitive skin. The product comes in paper box, sealed in nylon. 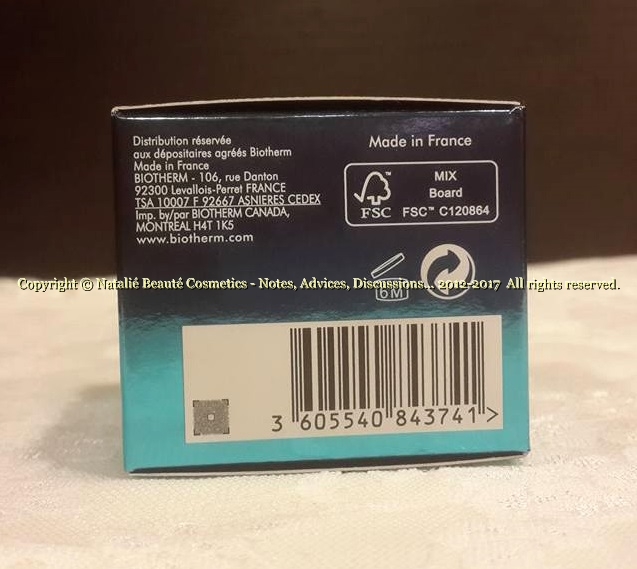 The batch code is on the bottom of the box. The cap is plastic, dark blue color. 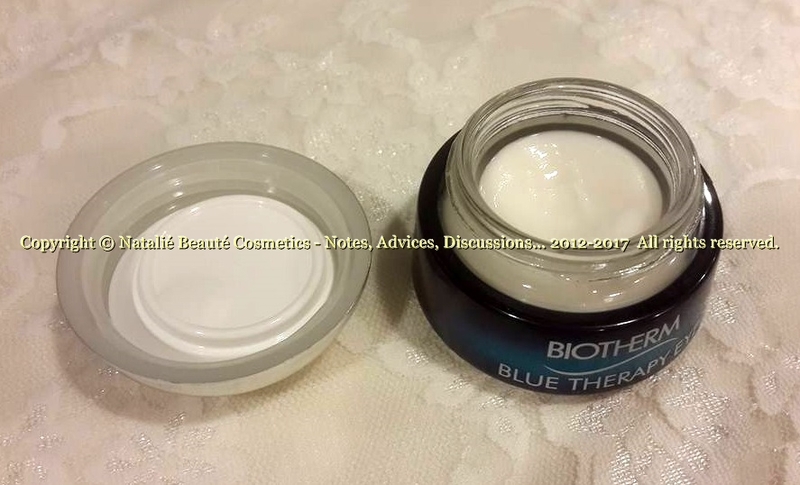 There is half-transparent plastic membrane, closing the jar, with the relief name of the brand - BIOTHERM. The jar is made from glass, massive glass. 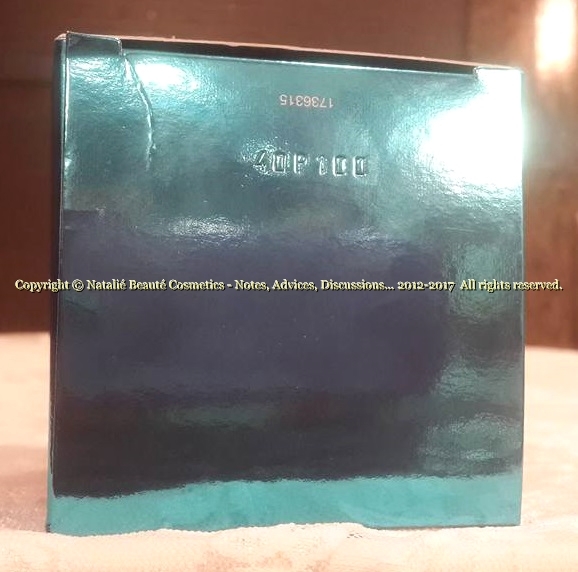 The older edition is all in dark blue color, the new edition is gradually changing the color from light blue to dark blue in direction down-up. The name of the product is signified with transparent nylon label, white letters, sticked on the jar. The batch code is engraved in the glass body of the bottom of the jar (the code seems in very light, almost transparent white color). The code is hardly visible. You must observe the place carefully. Touch with the tip of the nail all around and you will find it. The cap is plastic, silver mirror appearance. There is white plastic membrane, closing the jar, with the relief name of the brand - BIOTHERM. 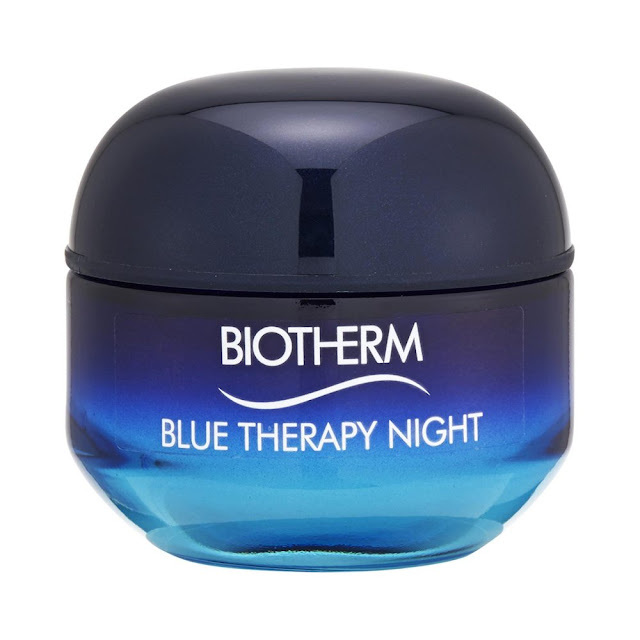 The jar has dark blue color appearance with metallic light blue spot, surrounded by the name of the product in white letters. 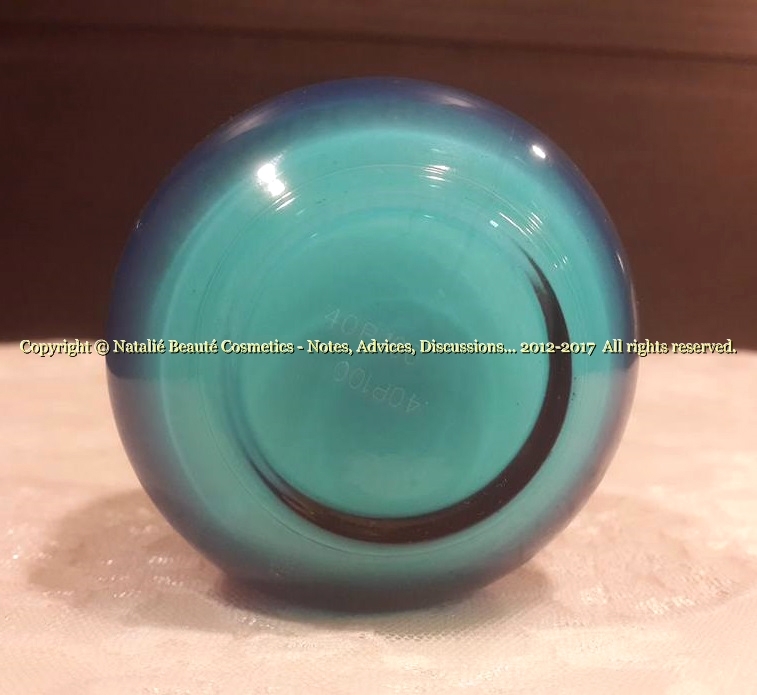 All this is made from colored nylon, wrapping the small jar (which original color under, is transparent massive glass). Pay attention - the Batch Code MUST BE engraved in the glass body of the bottom of the jar 2 times in 2 different directions, opposite to each other. The symbols are very narrow. 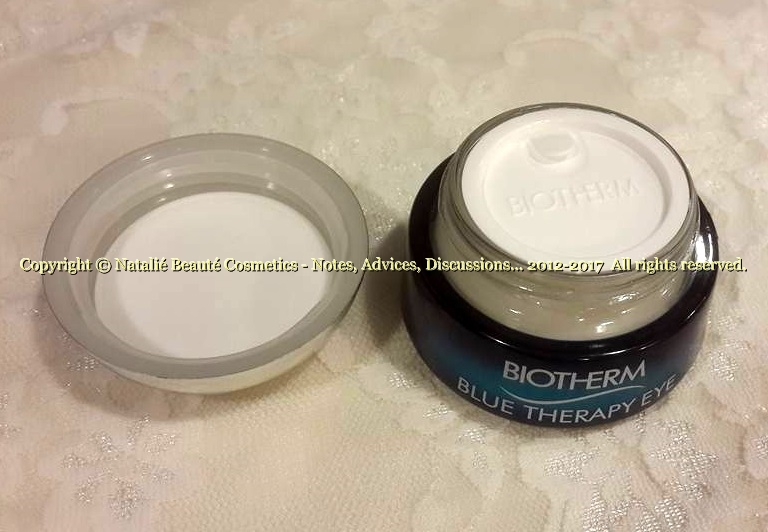 Because the bottom ot the jar is transparent and the product is very light color, the code is extremely hardly visible. You must observe the place very carefully. Touch with the tip of the nail all around and you will find it. I can say, that my searching for working night cream and eye cream, was successful. I found these two working products. They are for all skin types, but also they are suitable for sensitive skin, too. 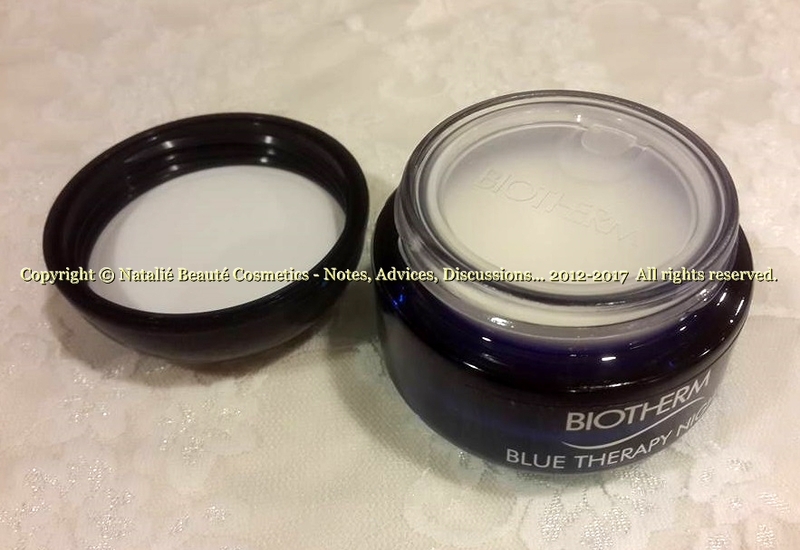 Highly tolerant to the skin (of course, always make test, before you start to use new cosmetics). 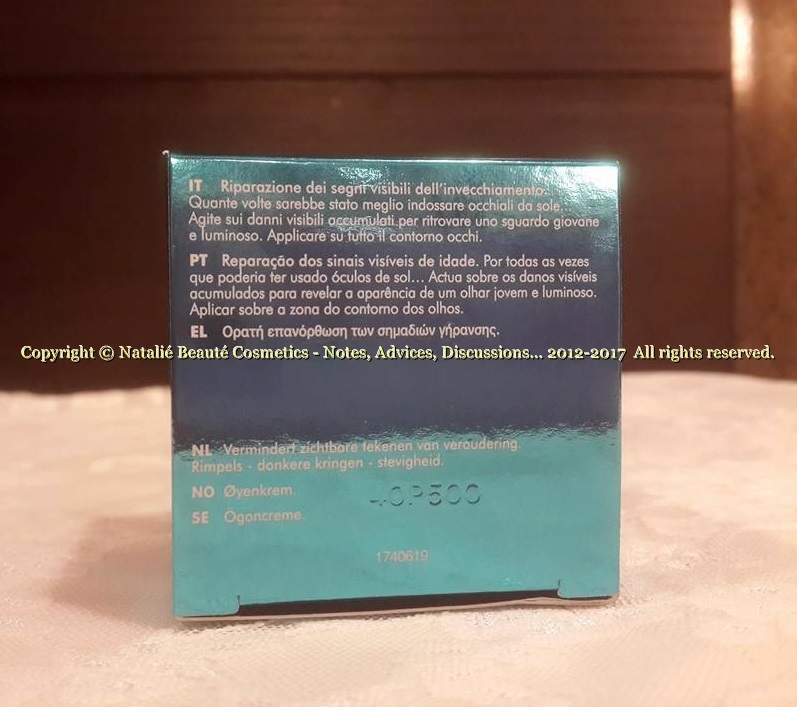 The first visible effect is relaxed skin, evens the tone, improves the elasticity. Day by day, they are becoming visible other improvements - fine lines become blurred, less visible. 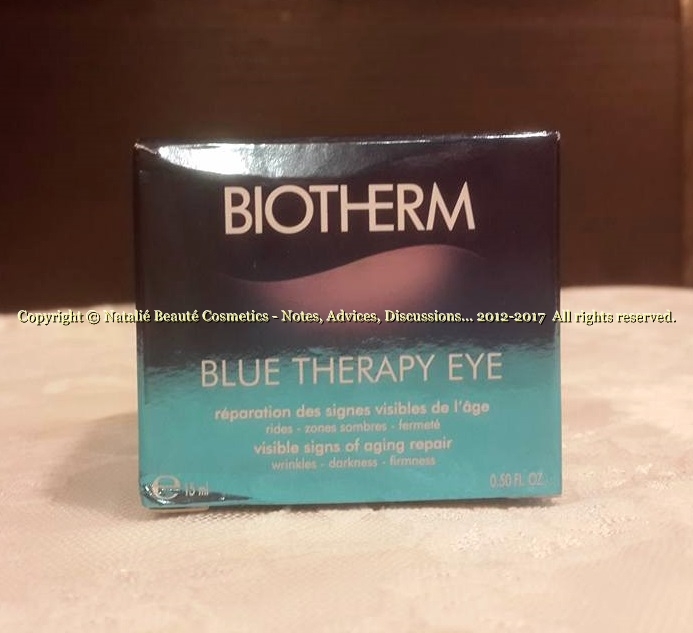 In my opinion, BLUE THERAPY NIGHT and BLUE THERAPY EYE by BIOTHERM, are high quality products, which are really working and doing, what they claim to do!